Original Thread: Kiss from a Rose, and a Turtle, and a Cop, and Godzilla: Let's Play Chulip! "Video games, contrary to the all the bad the press they might have been given, are nothing but love. What must remain in mind is the message going on between the developers and the player: video games are love." Chulip is an adventure/simulation game for the Playstation 2 that was released in 2002 and, after a very rough localization process, saw an American release in 2006. Sorry Europe. It was also released for US PS3 in 2012 as a PS2 Classics title, despite dismal initial sales. 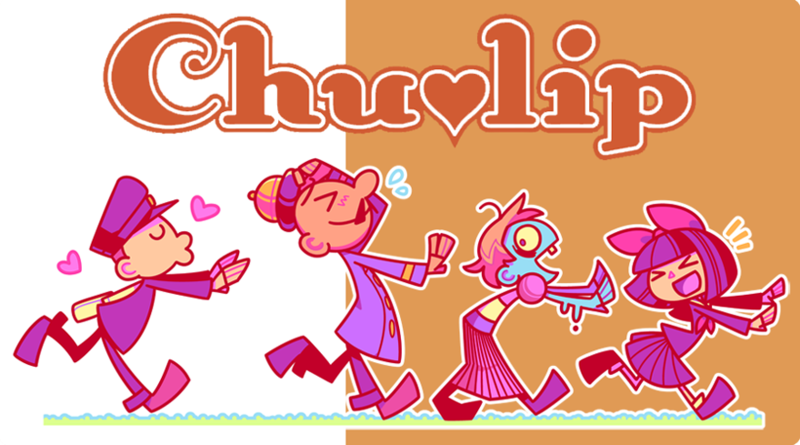 The idea for Chulip came from two experiences that the director, Yoshirou Kimura, had. The first was that, during a visit to Europe, Kimura saw many couples kissing in public, which was a sight not often seen in Japan, where public displays of affection are generally discouraged and in some cases frowned upon. The other was during a party Kimura was hosting, where his drunken friends began shouting kiss me (chu-shite in Japanese) before talking about video games. The game stars Poor Boy, who just moved with his father to a quaint Japanese town, Long Life Town. During the move, Poor Boy had a dream about meeting and kissing a beautiful girl. When he goes to meet his new neighbors, he discovers that this girl is real, and lives in his new town! Unfortunately, he has no experience with love, and cant express his feelings to her properly. Desperate to win her love, Poor Boy soon embarks on a journey to understand love and happiness. With a little help from the people he meets, Poor Boy is going to find the words he needs to make her understand, no matter what it takes! Chulip is extremely obtuse, and a lot of the hints are either randomly given to you under specific circumstances or need to be parsed out via trial-and-error. The manual for the game even has a walkthrough and hint guide in it to help lost players along. The director has said that the game is about exploring rural areas of Japan and the lives people lead there, so it encourages exploration and examination in order to understand the world. I think that, while there isnt always enough in the game to move you forward in the story, there is a lot of charm to be found in Chulip if you take the time to explore. The game has stuff to say on subjects like suburban life, Japanese society, and business culture, and each of the characters was built to be unique, with their own little quirks that make the game feel special. Its a flawed experience, but its a charming experience for sure. "If I could cure one person's woes by kissing them, I'd kiss my neighbors. We know less and less about our neighbors, especially in big cities. I think we are afraid of them and don't want to be bothered, but that is not good. Kiss your neighbors. Better love than hate." Im ChorpSaway and Im the Poor Boy who will be searching for love. Acting as my questionable Cupids I have TheJayOfSpade, FutureFriend, Hobotron and Taoc as rotating guests. Together, well kiss all the residents of Long Life Town and the surrounding areas and have a good time looking into this quirky little game. Ive tried to be pretty snappy with my playing and editing so well probably be a bit more focused than usual but Im sure well still be able to find plenty of time for jokes as well. I will be showing off as much of the game as I can, including kissing all of the residents and as much of the hidden signposting as I can. Ill also be getting translations for the portions of the game that were left in Japanese, and going over the substantial bonus content. "Making games is, for me, like writing poems. I want to write my poem for everyone on this planet - not just for the Japanese, but for all people in the world." "What I like the best to get ideas is, around my place, there's an old guy who's always drunk and always chatting about everything. I like to hang out with him, and maybe get new ideas from him." The 12 year-old who just moved to Long Life Town with his dad. He met the girl of his dreams, literally, and is on a quest to properly show her his love. The 14 year-old girl of Poor Boys dreams. The daughter of Goro and Julie, she ran away from home into an empty lot in Poor Boys neighborhood. She loves stargazing. Poor Boys loving father. He always seems to be reading the newspaper. Hes so worried about his sons reputation in Long Life Town that he cant sleep. Long Life Towns resident street sweeper, literally. Although she looks old, shes only 29. Michelle seems to have some odd habits, particularly when speaking to others. A turtle living in Leo's home. He loves to figure draw, but can't seem to find a subject. Long Life Towns resident doctor. His hospital is right next door to Poor Boys house, which is convenient. Dr. Dandy seems to have some trouble sleeping as of late. A poor busker, living in a trailer home. He loves music, but it has yet to make him any money. Batayan hopes to find a job soon. The owner of the local antique shop. He owns a dog named Rocky, though he seems rather ornery. Cheapot enjoys waxing nostalgic after hours. Girls father and a sweet potato salesman. Hes a film and sweet potato enthusiast, treating them both as the highest art. Goro spends most of his day drinking at home. Girls mother and the owner of a yakitori stand. She is the sole breadwinner of the family, and a wine connoisseur. Julie is unhappy with her husband and his laziness. The owner of Long Life Towns sweets shop. She seems very kind. Plums most prominent feature is her dentures, which appear to be larger than her mouth. The sole member of the Long Life Town police force. His large head is intimidating, and he loves his night patrol. Policeman keeps track of all crimes in Long Life Town, waiting for the day he can arrest someone. The local train conductor, as his name implies. Hes always on time and takes his lifes work very seriously. Conductor loves trains, and hopes to find someone who appreciates them as much as he does. A teacher at Long Life Towns school. He lives in the sewer near Poor Boys house, and acts as a mentor for him. Suzuki understands the nuances of love, and enjoys writing poetry. Long Life Towns legendary being. It is said that any two lovers who kiss underneath the tree will be together forever. Lovers Tree keeps track of Poor Boys progress and bestows power upon him. A friend of Mr. Suzukis. She unpeels her outer layer when vulnerable. A professional boxer who trains on light poles. Hes got good stamina, but a long combo can tire him out quick. A hermit with a rocket on his head. He wants to go to space, but he needs to practice his landing procedure. A bookworm. Even with her very large glasses, she seems rather clumsy and prone to tripping. A struggling musician. He hopes someone will show up to appreciate his work. A professional trash can who has since retired. It seems like he misses his job. One of the teachers at Long Life Towns school. He is frustrated that he hasnt gotten paid lately, and continues to badger Mr. Suzuki about compensation. A retired teacher who now lives in the Worldly Desires Temple cemetery. He seems to have issues with the current temple monks wooden gong. The head monk of Worldly Desires Temple. He spends all day going out begging for money. He loves all people, especially those that make donations. The daughter of Monk Hoichi and a follower of the Worldly Desires Temple. She handles temple maintenance, and is concerned about the temple bell. A 20,000-year-old man with a love for jogging. Perhaps if you followed him you could discover his secret to fast travel and longevity. A frog with a water lily parasol. Whenever he hears the temples bell, he knows that its time for a short swim. A distressed man in constant pain. Hes not actually scary, but his stretching is a little unsettling. A reasonably sized monster with a love for destruction. He enjoys stomping around the park, but gets tired if he does it too much. A girl who likes spinning. Maybe if you could spin as well as her, shed open up to you. A train otaku. He seems to enjoy following the train schedules, and playing in the park. A yokai living in the cemetery. He loves to jump from gravestone to gravestone, but he has difficulty keeping balance with his large nose. A literal straw man, cursed to stay on this mortal plane. He vents a lot in the middle of the night, but doesnt have too much stamina. A boy with an eggplant for a head. As he said, an eggplant is an eggplant. Simple, no? A man wearing an advertisement sign on his back. He doesn't want people to notice or pay attention to him, but he's pretty bad at hiding. An athletic koala who's training for the Olympics. His specialty is the backflip jump. Someone should show him appreciation for his hard work. A Peruvian culture enthusiast with a hot new song. He enjoys games of Red Light, Green Light. The Long Life Town's bathhouse owner. He's rather knowledgeable about a wide variety of subjects, particularly tea brewing. He has a particular appreciation for the arts. A retired teacher who now lives outside Funny Bone Factory. He is well-versed in many martial arts and board games. He wants to see Poor Boy climb the corporate ladder. A girl floating near the Funny Bone Factory. She's trying to fly away from the area, but she can't get enough air. The higher-ups at the factory have decided that her stunts are equivalent to advertisement for them. A philosophical man who lives in a box. He would love to talk about life with someone. Maybe you can get him to open up? An old-school robot toy who commands other toys. He enjoys talking walks late at night. The robotic older brother to Yodzilla, though he's not much bigger. It seems he's gotten several enhancements thanks to his time at the factory, including a new roar. A kid with a puzzle piece for a head. He feels like he's missing something in life, maybe someone can help him feel whole. A retired teacher who now lives in Scarecrow Field. She's a UFO enthusiast and interested in extraterrestrial life. She wants you to believe, too. The titular scarecrow of Scarecrow Field. He used to be an important figure within Funny Bone Factory, but has since retired. He'd love to know what his friends are up to. A lady living in a clam shell. She seems a little under the weather, and she has difficulty opening up. Maybe you could do something to warm her up first. A rich guy who's under fire from a Sniper. He's scared to go out, but he also really needs to use the bathroom. An assassin out to kill Target. He has incredible accuracy and range, so be careful around him. He won't let his guard down when he's looking down his scope. A spider with a face on its abdomen. Is that his true face, or merely a decoy to attract victims? No one's quite sure. A swimmer living near the Funny Bone Factory safe. He's training for the Olympics, and his swimming and diving skills are incredible. He only loses focus when he comes up for air. A thief that comes from a long line of thieves. It seems like his latest mark is something at Julie's Bar, but what could it be? A lonely zombie living in the cemetery near the Worldly Desires Temple. She has an affinity for tea, though she seems to be having trouble remembering her original recipe.